People who smoke or have smoked in the past are at risk for developing lung cancer. There is no way to predict who will develop lung cancer and traditionally tests are done only if you develop symptoms such as a cough, difficulty breathing or coughing up blood. MIC offers lung cancer screening using Computed Tomography (CT) to produce very detailed images of the lungs which allow our radiologists to detect small nodules or lumps. This information helps make the early detection and management of lung cancer possible. Smoked at least 30 ‘pack years’ (1 pack per day for 30 years, 2 packs per day for 15 years) and are either currently smoking or have quit smoking within the past 15 years. In these patients, there is a decreased chance of death from lung cancer due to earlier detection and management. The majority of these examinations will be normal. Similar to other types of cancer screening, it is important to continue with screening studies at regular intervals. Currently, yearly lung cancer screening CT studies are suggested until the age of 74. Larger nodules found in a CT scan may need further investigation and in some of these cases, other tests may be necessary to determine whether the nodules are cancerous or benign. The technologist will position you on the examination table, usually lying flat on your back. You will usually be asked to raise your arms over your head. Next, the table will move quickly through the scanner to determine the correct starting position for the scans. Then, the table will move slowly through the machine as the actual CT scanning is performed while you hold your breath for the short 5 to 10 second scan. 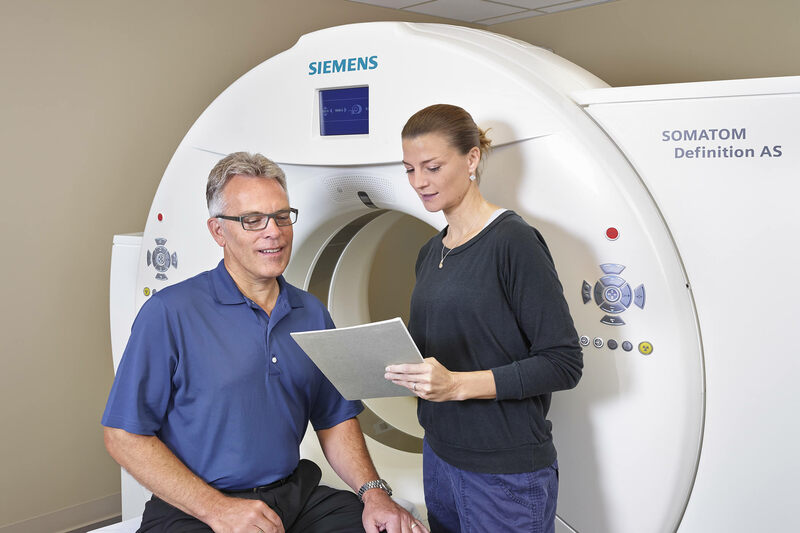 The radiologist will review all of the scans and send a detailed report to your practitioner, usually within 24 hours.